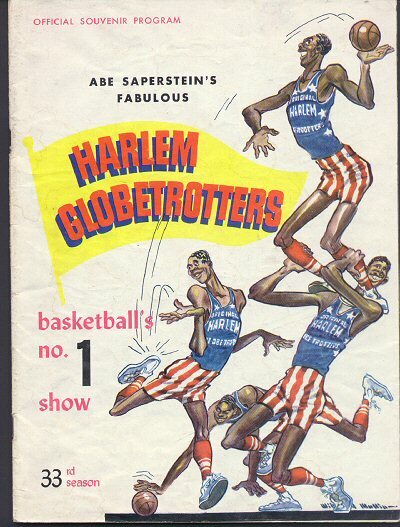 "Harlem Globetrotters Souvenir Program - 1959 - Trip to Soviet Union during Cold War." (1668) Harlem Globetrotters Souvenir Program - 1959 - Trip to Soviet Union during Cold War. - Condition: Very Good Wonderful memorabilia of the famous Harlem Globetrotters! Program includes many photos of the team, including as they are leaving New York for their historic trip to the Soviet Union, Prseident Eisenhower with picture of note he sent to the team, photos of their visit in Russia, Russian people including Premier Khrushchev, tour of Italy, Ireland, and Alaska. Program includes several interesting ads. Also has individual biographies of each player including the amazing Meadowlark Lemon. The program measures 7 1/2" by 10" and has 26 pages. Price: $14.00 + Shipping.